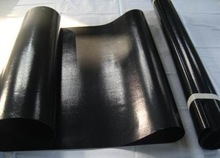 Our anti-stat PTFE coated fabrics are manufactured from woven fiberglass substrates with a special formulated coating to dissipate surface static buildup. The fabric is black and has the best heat transfer of any of the PTFE coated fabrics. Available in standard thicknesses of .003″, .004″, .005″, .006″ & .010″. Higher mil thicknesses are available. Typical applications are release sheets, food hydration and vacuum bagging.